Ford has revealed that its new Fiesta ST will cost less than £19,000 with orders now being taken and deliveries starting summer 2018. 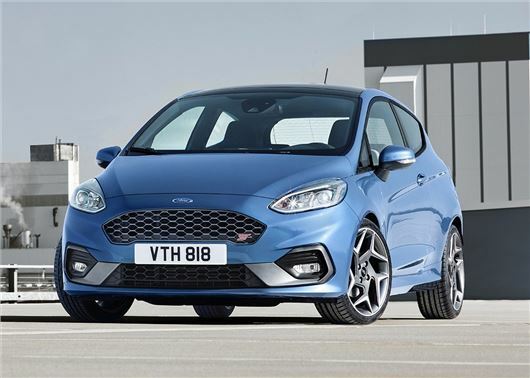 The turbocharged hot hatch will start from £18,995 in entry-level ST-1 trim, which features selectable drive modes, Recaro seats and sports suspension as standard. All models come with Ford's SYNC3 infotainment system including DAB radio and Apple CarPlay and Android Auto capability, as well as cruise control. The three-door ST-2 is £19,995 while the five-door version costs £20,645. This adds climate control and heated Recaro seats with blue seatbelts. There's also a larger eight-inch touchscreen display and a premium B&O sound system. Topping the line-up is the ST-3, which starts at £21,495 for the three-door and £22,145 for the five-door. This includes 18-inch alloys and red brake calipers, as well as navigation, automatic wipers and driver assistance features including traffic sign recognition and high-beam assist. Enthusiastic drivers can opt for a Performance Pack which adds £850 to the list price and includes a Quaife limited slip differential, launch control and performance shift lights. Other optional extras include full LED headlights (£600 on ST-2 and ST-3 models) and Blind Sport Information System with Cross Traffic Alert for £475. The new Fiesta ST uses a three-cylinder 1.5-litre turbocharged engine - a move that risks being controversial among fast Ford fans. The new turbo'd unit produces 200PS and takes the Fiesta ST to 62mph in 6.5 seconds and a top speed of 144mph. Cylinder deactivation technology contributes to a combined fuel economy of 47.1mpg and CO2 emissions of 136g/km. For the first time, the Fiesta ST will come with selectable drive modes, allowing the drivers to flick between Normal, Sport and Track settings. Buyers get a choice of seven colours: Race Red, Frozen White, Magnetic, Moondust Silver, Shadow Black, Siselver Fox and Performance Blue. The latter's exclusive to ST models. The Fiesta ST's start price makes it cheaper than rivals including the Peugeot 208 GTi and Volkswagen Polo GTI. It's also only £1000 more than the Suzuki Swift Sport warm hatch. I bet Suzuki feel a bit silly asking £17,995k for their 'warm hatch' Swift Sport now Ford's proper 'hot hatch' of choice starts at £18,995 (albeit with probably less standard equipment, but I'd rather have the choice of a more capable / exciting car with less kit rather than a not-so-good one with lots of unwanted kit). I've driven it and the 1.5 engine has a lovely sporty note and I can confirm it is very quick. Gear shift is particularly short & sweet. Its only a pity Ford dont have access to VW soft touch plastics. Lovely car.